paints; larger threads on the nozzle that offer a more secure fit and better centering of the nozzle; redesigned tapered gravity-feed cups that ensure easy clean up and more efficient paint flow; and a single-piece auxiliary lever/needle-chucking guide that provides easy assembly. A larger 1/3 oz. (9 ml) gravity-feed cup and larger (0.3-mm) needle/nozzle configuration allow for use with most media. Produces fine hairlines to finely atomized background spray, along with an entire range of stippling effects. When working in medium- to large-sized areas with a larger amount of paint, a siphon-feed airbrush is preferred. Siphon-feed airbrushes require slightly higher air pressures to pull paint up from inside the attached bottle. Siphon-feed bottles have more paint capacity. And since they are interchangeable, extra bottles can be filled with a variety of colors to make for quick color changes. flow spraying and wider spray patterns. Air Pressure: Ideal operation is between 10 and 60 psi. that's ideal for custom automotive painting. against moisture, the HP-TR2 gives total control over paint and spray just like conventional airbrushes. This design offers the same comfort and feel that's typical of a larger spray gun. Impervious to solvent-based paints thanks to the Teflon packing needle seal, which can be easily replaced. The FA450 Pistol Grip Filter can be used with the 1oz. and 2oz. side-mount bottle sets (sold separately). outperforms all others in its price range. or heavier paints; redesigned trigger mechanism and larger needle-chucking nut for easy assembly; and replaceable internal Teflon™ needle packing for use with solvent-based paints. 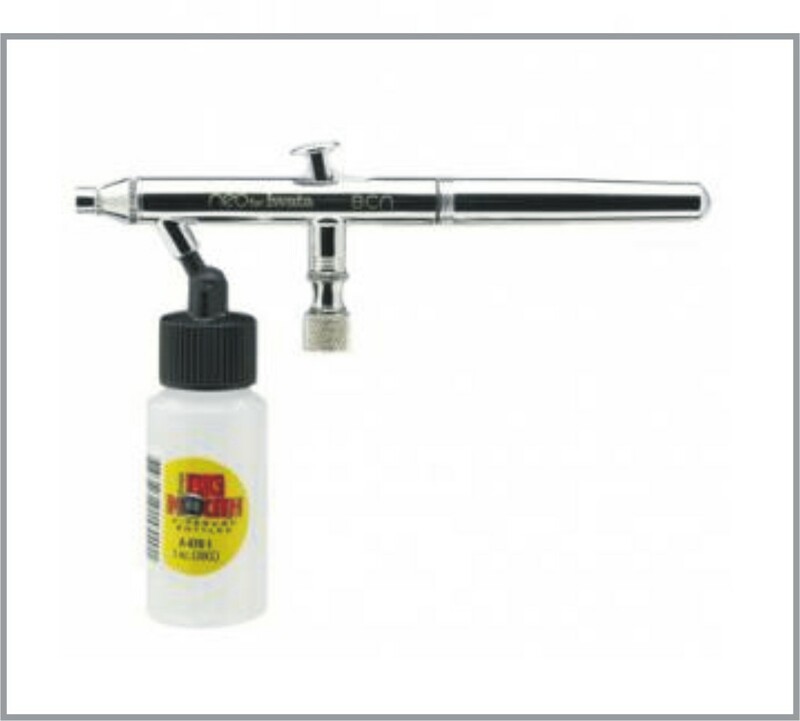 A gravity-feed airbrush designed for quick changes of custom mixed colors.· Versatile for moderate detail to background spraying. needle combination (0.5-mm) that makes for easier spraying of thicker or heavier paints; redesigned trigger mechanism and larger needle-chucking nut for easy assembly; and replaceable internal Teflon™ needle packing for use with solvent-based paints. Siphon-feed model makes it easy to swap out bottles of specific colors quickly. Useful for T-shirt painting, model-railroad landscapes, R/C car painting, airplane models and other general art, hobby and craft projects.